Birthday: 90th of Summer, 489AV. Var and Kiris are immediately notable within Riverfall for their physique, although outside of Riverfall, where Akalak are less common, they are no more noticeable just for being an Akalak. Within the city, however, they are an anomaly. Standing on the shorter side of Akalaks, at 6.0", they are the classic ectomorph, slim shouldered and wiry though well muscled with the training all Akalak undergo for the rites of trial and passage. It is a source of some discomfort for Var, although Kiris has embraced their body as they approach manhood and plays to their strengths when in training and combat. Their height is less troublesome than their weight, however, and they eat near constantly in addition to training in an attempt to gain muscle. They keep their hair long and in the classic warrior's ponytail that falls to roughly between the shoulder blades, but rather than shave the sides of their head as is popular, Kiris tends to braid it back for them and let the rest hang loose. He maintains that the roguish look is more aesthetically pleasing, and Var lets him as it doesn't matter to him one way or another. They inherited their mother's eyes, although paler in colour, and their father's straight, slightly hooked nose. 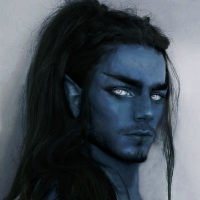 Var and Kiris are somewhat grey-toned, for an Akalak, which is an advantage to blending into the colourless night that they so love. Aside from their weight (and to some degree, their height), Var and Kiris are relatively nondescript in appearance, favouring no particular clothing style or mannerism that would cause them to be notable. They are deep-voiced like many Akalak, but faintly husky, and Var can be distinguished from Kiris by quieter tones and an absence of vulgarities in his speech. Var Likes: Warm weather, writing, learning and magic. Var Dislikes: Being disturbed from his work, Gods-botherers and small animals. Kiris Likes: Dusk, mysteries, climbing and practical jokes. Kiris Dislikes: Bright sunshine, hesitancy and looking messy. Both Like: Stone buildings, fish (cuisine), training, swimming and word play. Both Dislike: Spicy food, fruit, rain, Zith and the undead. Var and Kiris are characterised by eternal struggle, though with what, whom and why tends to vary. Though stoic and calm when communicating externally, internally they are a rabbit warren of desires, disappointment, determination and despair. They live their life fairly simply in practice; after Kiris' manifestation, both souls shared equal time within their body, trading back and forth to eat, sleep, train, interact and explore, although they have their preferences as to whom does what, at which time. If addressed, Var will introduce himself with his name and then his soul-brother's; to outsiders, the second name is merely a surname of sorts. In turn, Kiris will use Kiris Var. It helps to remember which stranger has met which brother, and therefore whom the stranger is most used to speaking to. Both souls are devout in their own way, although Var favours Wysar and Kiris, Akajia. The influence of their Gods is prominent in their lives. For all their prayers and actions, however, there is a lingering discontent in the trajectory of their lives, as though they have failed in some way to exemplify what they aspire to. Var in particular is disillusioned with his strengths and abilities, seeing the favour of Wysar as a goal he cannot hope to achieve. Ironically, it is Kiris who displays the discipline that could attract Wysar's favour, but his eyes are for Akajia alone, whose shadows hide secrets that call to him. They both yearn for knowledge above all things, and wish to use that knowledge to elevate them in reverence to their Gods, to help those they care about and, in all honesty, to have fun. As friends, Var and Kiris are loyal, affectionate and steadfast, although Kiris is more mischievous and a bit of a tease. It can be a shock to be so dourly insulted one moment, only to look up and see a twinkle in a pale blue eye that invites you to fire back. Var is an observer, primarily, and Kiris is a soul of action. They know well enough to listen to one another, acknowledging the other's strengths, but as they are still young; occasionally there will be discord. Though they have been at odds at times, Var and Kiris have a combined purpose, and that is to be more than of use to the Gods and the community, but of true value. Having left Riverfall, shame from their failed trials has fostered bitterness towards their home as a deflection from the disappointment in themselves, and it was this that prompted the long journey to Lhavit, though the city itself was the real attraction. In time, they may return to Riverfall, but if they do, it will either be when they think they are worthy, or when they know they are. Last edited by Var Kiris on September 2nd, 2018, 2:24 pm, edited 16 times in total. From the time of their birth to their arrival in Lhavit, Var and Kiris have felt the weight of expectation rest heavy upon their shoulders. Born to an Akalak miner and a frail human mother, Var felt the struggle that most all Akalaks feel in the call to progress their race with all the physical strength and vitality he could muster. As an infant, he suffered a failure to thrive, and the death of his mother only a few months after his birth only increased the odds against him. The effects of his ill health during childhood have followed him into adulthood; however, at the age of thirteen, Var met his lifelong companion for the first time. Kiris first spoke clearly to Var two years before their first rite of trial. Vibrant and full of hope and curiosity, Var's 'dark' soul had only that short time to share with him before their trial was upon them. With Var's discipline and Kiris' quick wit, they managed to survive their failure, but Var's already dwindling spirits were brought lower by the experience. He had dismissed his own insecurities about his size as mere vanity, but now he found that, indeed, he could not follow the same path as all his of ancestors before him. Var and Kiris survived two more attempts at the rite of trial before it was Kiris who said 'enough'. It was not a defeat, to him, but redirection. They had nothing else to do but train for further attempts, as they could take no profession, but it seemed auspicious to Kiris that they had failed and yet lived (despite serious injuries). If they were truly purposeless, surely they would have perished like many other underperforming Akalak boys? The answer, he supposed, lay in their deities, who had given their race life. Wysar and Akajia had given and had not yet seen fit to take away. Believing that Wysar could hold the key to a future success, Var studied what teachings he could and cooperated with Kiris whilst his brother followed less scholarly pursuits. Roaming the city at night, Kiris sought Akajia; scaling walls, increasing his flexibility, keeping a watchful eye and a listening ear, and going where the night took him. The boys shared their joy in what they'd learned, but again it was Kiris who was the catalyst for their leaving Riverfall. Var expected to train until they could at last complete the rite of trial successfully- they were nearing the age of the rite of passage, and there would be no more chances for a trial after that. Kiris expressed his wish to go beyond the city walls, to a place where no restrictions were put on skills and knowledge, nor on whom obtained them. There were many arguments about this. Var thought it cowardly to leave, Kiris thought it prudent. As the rite of passage approached and no trial successfully completed, Var finally gave in, and the Akalak left the city. No one would have him for an apprentice in Riverfell, and he'd have the boat journey to Lhavit to reflect on the path ahead. They had their father to thank for the funds to proceed. Though not approving, their father bid them return with the ability to pass their rites or not return at all. Somehow, despite his failures, his son was alive, and this was auspicious enough for him to keep his faith that perhaps Var Kiris would become a man after all. If that day should ever pass, there would be a Lakan waiting for him back in Riverfell. Last edited by Var Kiris on September 1st, 2018, 2:18 pm, edited 9 times in total. Last edited by Var Kiris on September 5th, 2018, 9:00 am, edited 11 times in total. A simple room in the Solar Wind Apartments, Surya Plaza on Zintia Peak, the City of Lhavit. Var and Kiris live a fairly spartan lifestyle, so the minimal decor and sparse furniture of their new home does not trouble them. They are far from the top floors of the Solar Wind, preferring the lower levels closer to the street so that they can look out over the plaza at night during the busy hours. The only articles they don't keep put away neatly is Var's writing tools at their desk, as he likes to be busy, and Kiris has a tendency not to put their shoes away. Their Pycon companion, Eyes High, also resides with them in her own separate dolls house. They are comfortable roommates, and do not tend to annoy one another, save for Eyes' dog companion. Kiris finds animals acceptable, whereas Var finds them disruptive. Var and Kiris wear a crude leather wristband upon which is carved the twin symbols of Wysar and Akajia. Their father, a non-expert crafter, etched the symbols upon a bone tag and gifted it to Var on his second birthday. They have long since outgrown the original leather, but replace it annually as they grow so that it always stays with them.